Oh for the days of Lord Copper and the Daily Beast when you could just make things up and stick them in your paper, and everyone would believe you, or at least think it was as likely as the polemic coming from the other side. Those days, alas, are gone. A small number of minor scuffles broke out between the opposing sides who were then separated by police. One man taunted pro-abortionists by removing his clothes to reveal a crucifix shaved on to his chest. Double click for a larger image (so you can read the caption). Ok, so maybe the PA's fearless reporters just got confused. Funny how all the confusion in the article has the effect of presenting the pro-lifers as aggressive, isn't it? But they could have checked. 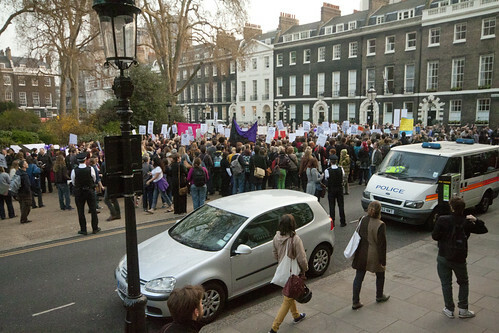 Update: thanks to all the pro-abortionists who are determined to spike my stats, and are so worried about the photos showing the relative numbers of pro- and anti-life groups in Bedford Square. In order to get round this it has been suggested that the photos were taken before 7pm, which was the official start time (actually, that was the time Bishop Hopes was arriving, the witness was there all day), in some sneaky ruse because we unfairly got there early. Anyway, if anyone wants to check the Exif data they can see for themselves that the earliest photo was taken at 7.10pm - the data is available on Flickr. Yes, that's right, I was a bit late - traffic is dreadful in London these days! The great thing about blogging is the possibility of instant rebuttal. I've been beaten to the punch by Lawrence England, but on the other hand I've got photos to show the falsity of the claim being made that the pro-lifers were outnumbered by the counter-demonstration. This was in fact the reverse of the reality. It's not easy to get good photos of large crowds, even though I had a wide-angle lens. But I walked all the way round both groups and there is no question about it. Our group was enormous: I'd guess 400-500. Their group was less than half the size. We were standing on the raised pavement closest to the camera; the counter-demo was beyond us. 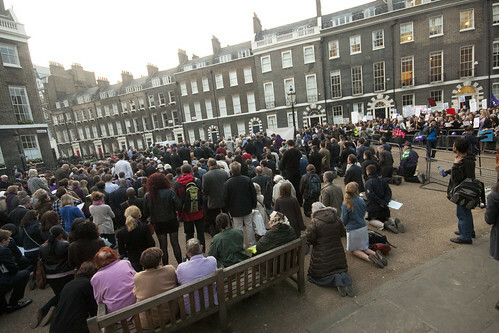 The street lamp (see second photo) and the park bench on the right (see first photo) were both well within our crowd. The counter-demo covered the much narrower band of pavement beyond this, and it wasn't very deep. You get get an idea how deep their group is from this photo I took from behind them. The street lamp in the photo below you can just see in the street view photo above, on the extreme left (you can't see the top). See that line of white posters people are holding up? That marks the front edge of the counter demo. That's where the heads of the 'pro-choice' crowd ends and the pro-lifers begin. 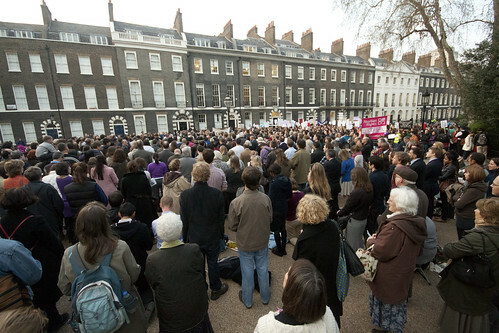 "Pro-choice protesters outnumber attendees at prayer vigil in Bedford Square"? I don't think so. No wonder the comment box on Fitzrovia News has been closed. You've got to hand it to the 'pro choice' crowd, what they lack in numbers they are willing to make up in influential media friends and sheer noise. It was also very noticable that they had put the most photogenic, female members of their group in the front row, facing us, for the cameras. They shrieked and banged drums more or less continuously. They seemed to be particularly wound up when we knelt down, which happened frequently as we did the Stations of the Cross. The whole thing added up to quite a party atmosphere. It should be noted, however, that more than one member of the pro-abortion group had to be moved on by the police from attempting to intimidate members of our group, having walked round to the other side of the group in order to shout abuse. Their main slogan was 'Stop harassing women' (which they pronouced in the American way, which was ironic as they also objected to 'American-style' tactics being used). Anything more clearly designed to harass and intimidate can scarcely be imagined than the noise they were making - and that was clearly the idea. 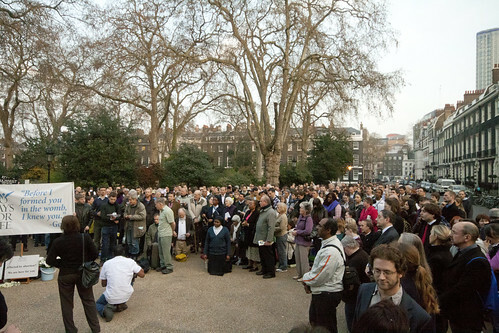 We were praying quietly - inaudibly, in fact, for most of the time, in the context of the din from over the pavement. But their efforts were counter-productive: the promise of a big counter-demonstration was what produced the huge pro-life crowd. I don't think anything like this has been seen for years. It suddenly seems that the whole abortion issue is back in contention: the pro-abortionists clearly don't think they can just ignore us. More photos of the witness. 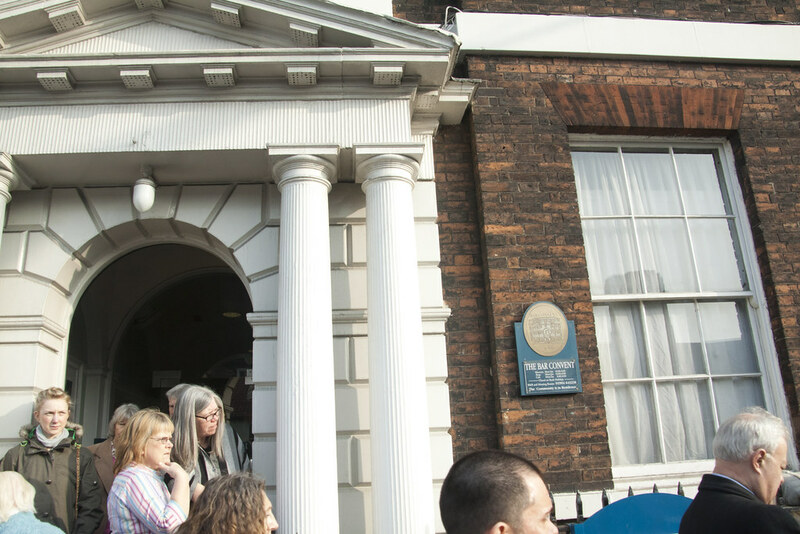 I hope to be in London on Friday 30th with the 40 Days for Life to support Bishop Hopes in the vigil outside the BPAS clinic: see here for more details. 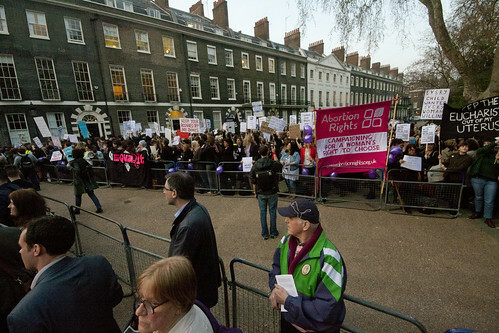 The pro-abortionists are running scared of this vigil and are planning a big counter-demonstration, so it is worth making an extra effort to get there. On Saturday 31th there is a vigil in Oxford, outside the entrance to the John Radcliffe Hospital - ie next to St Anthony of Padua, Headley Way, Headington, 3pm to 4pm. We pray outside while the Blessed Sacrament is exposed in the church. The LMS Pilgrimage to York is a great chance to appreciate properly the achievements of our predecessors in the faith in that part of the country: St Wilfrid's, the Shrine of St Margaret Clitherow, the Bar Convent, the English Martyrs church: these didn't build themselves, they are each a great testament to the piety of York's Catholics, and in particular their concern for the martyrs. Yorkshire was a great Catholic centre before the Reformation, with the great Cistercian Abbeys, and the fabulous York Minster itself. I visited two of the ruined Abbeys while up there (I'll blog about those too). 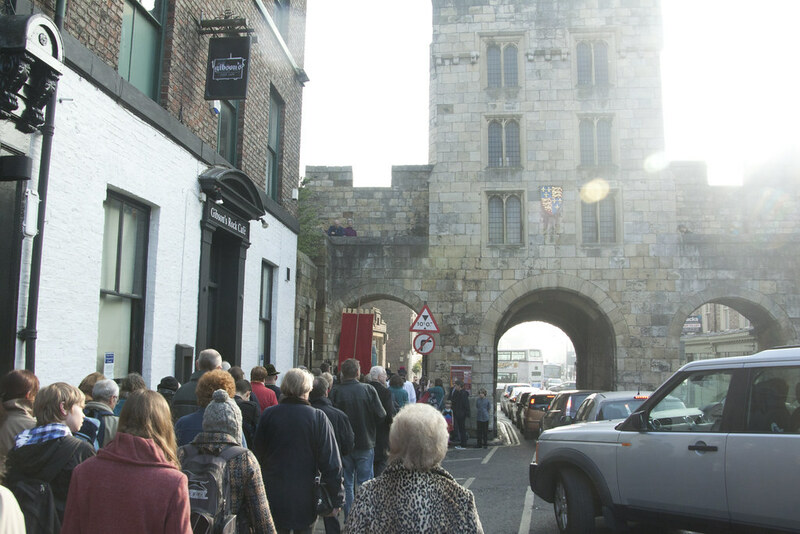 It saw some serious organised opposition to the religious revolution under Henry VIII - the Dissolution was actually reversed, briefly, in York, during the Pilgrimage of Grace in 1536 - and some very vigorous, bold, and imaginative work to maintain the Faith during penal times. 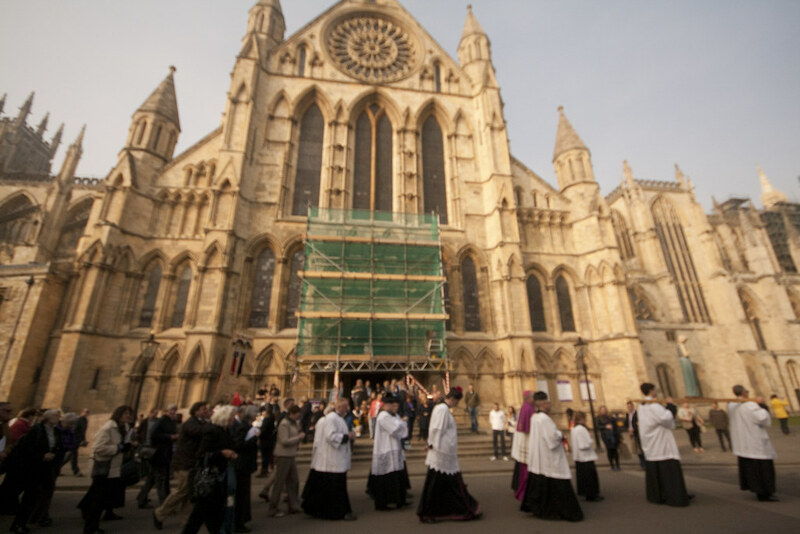 Some of the recusant priests actually celebrated a Solemn Mass in York prison at one point - an absolutely brilliant stunt. 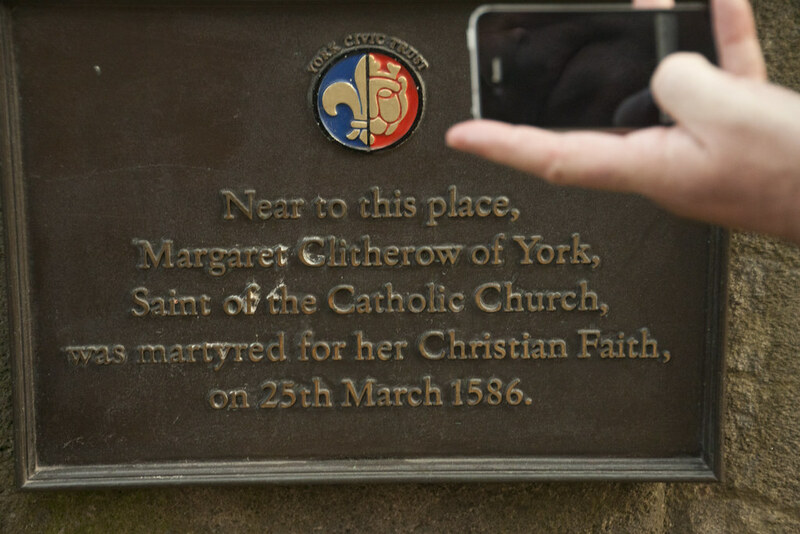 St Margaret Clitherow was part of this Catholic resistance; she was brave, articulate, independent, and highly organised, as well as extremely pious. 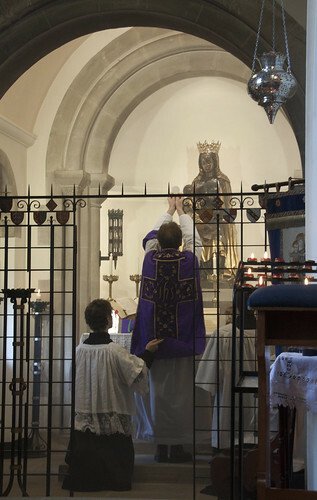 It is a great honour to have her, with the Welshman St Richard Gwyn, as a spiritual patron of the Latin Mass Society. One of the great things about Catholicism is the way it embeds itself into local cultures. So many great Catholics in the North died for their allegiance to Rome, which was part of a totally authentic local religious culture. This connection with Rome went back to St Benet Biscop and St Wilfrid himself. It was Protestantism which was imposed on the North - Protestant enthusiasts from the Continent, the southern port cities and a bunch of Cambridge intellectuals - who had to use force, over centuries, to impose their will, without ever achieving complete success. And in the 19th Century, when the penal laws were relaxed, the Catholic Church was again manifested in fine buildings filled with expressions of local piety. I was very struck by this window in St Wilfrid's. 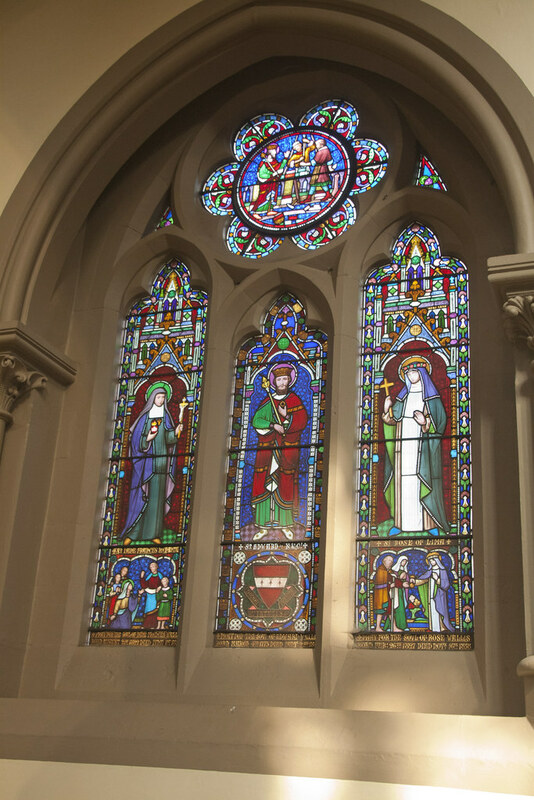 Each panel depicts a saint who shares a name with a deceased person in whose honour it was clearly given: St Jane Frances Chantal, St Edward the Confessor, and St Rose of Lima. A remarkably cosmopolitan trio of saints. 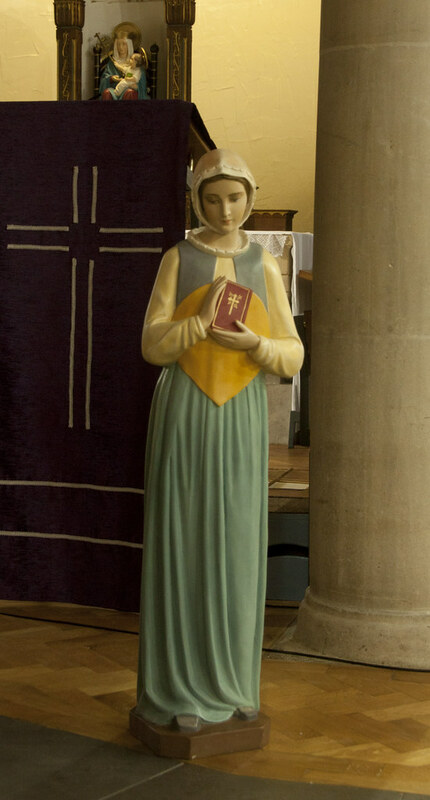 I was wondering whether the connection between the person honoured and the saints was just fortuitous - the person honoured might just happen to have been named Edward or Rose - then I noticed that the window depicting St Jane Frances Chantal was in honour of a Jane Frances Wallis, who was born in 1822. That is too much of a coincidence. 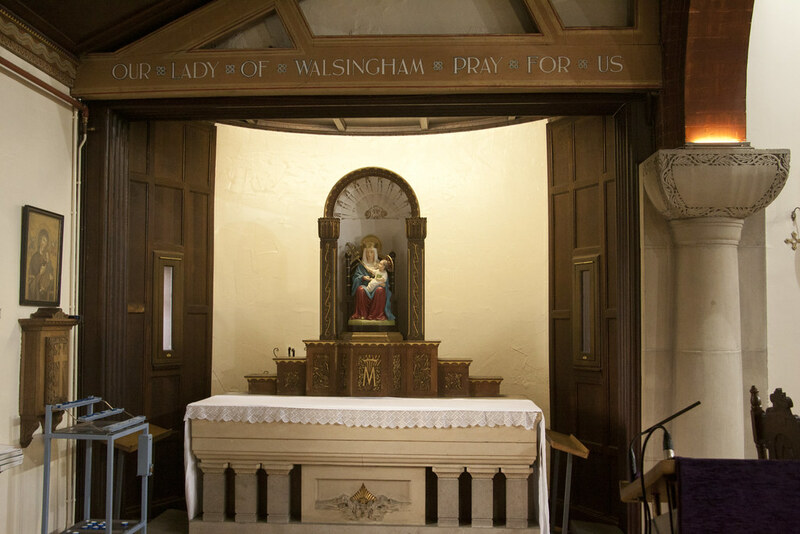 Her parents clearly had a devotion to the great mother, widow, foundress and friend of St Francis de Sales, and this connection was remembered a generation later by those who wished to keep her in mind after her death. May the many saints of the North of England intercede for the Church today! 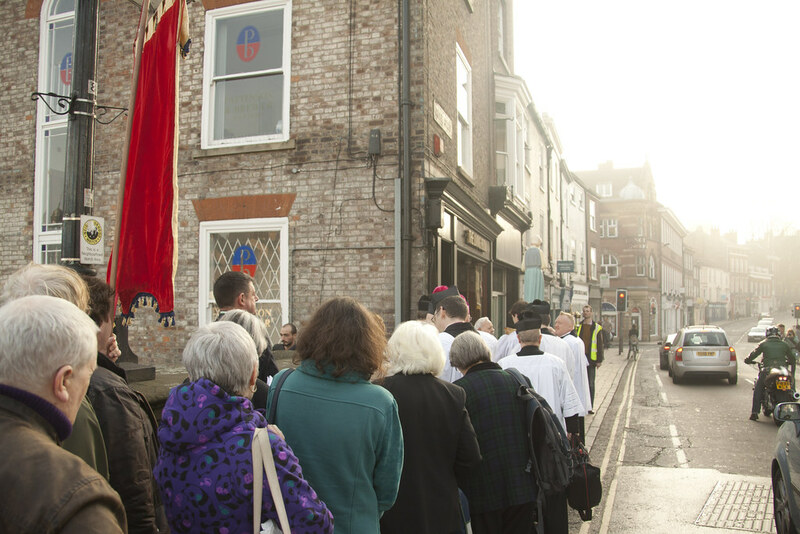 After Mass we gathered in the open area between St Wilfrid's, where Mass took place, and the Minster, and Bishop Drainey led the procession from there all the way to the Church of the English Martyrs. First we walked through the Shambles - called after the butchers who worked there. St Margaret Clitherow's husband was, indeed, a butcher, and they lived above the shop. By 'butcher' of course we don't mean a retailer of vacuum packed joints; the animals were butchered at the back. One of the houses in her street has been turned into a shrine; we paused outside it. Bishop Drainey then drew our attention to the site of the martyrdom itself, which is at the end of Ousebridge. This is marked by a metal plaque. ...and post the Bar Convent. All the time we were saying the Rosary. Finally we turned right and into the street where the Catholic Church of the English Martyrs is to be found. Another fine church. 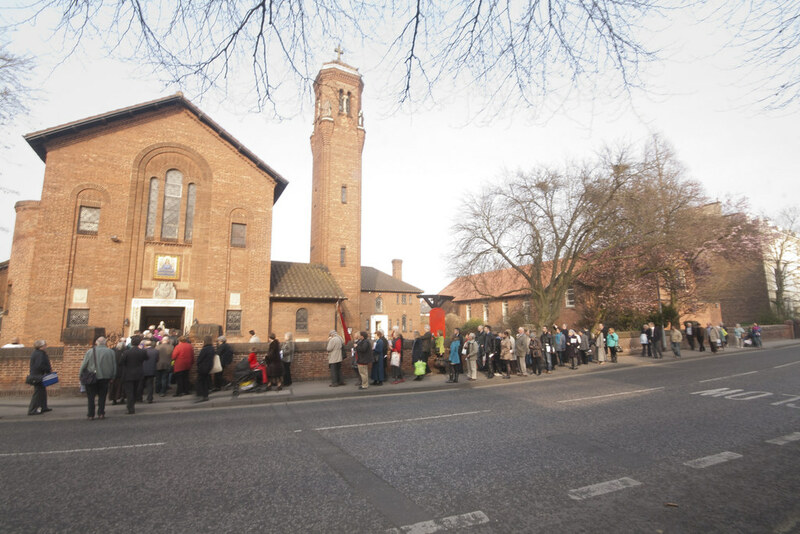 Only about half of the people at Mass in St Wilfrid's came on the procession (the choir sneakily used a mechanical means of transport to get there ahead of us! 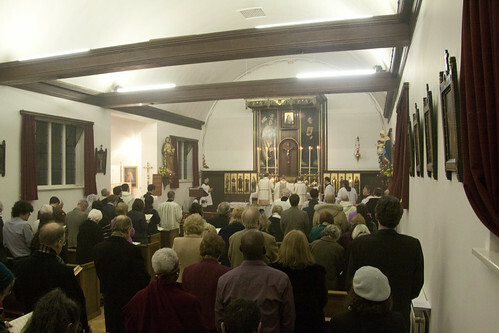 ), but the church was still pretty full. We all knelt to venerate the relic of St Margaret Clitherow, which is kept in this church, and Bishop Drainey blessed us with it. And then with the Blessed Sacrament. Then we all had tea, provided by some very nice local ladies, in the parish hall. As always it was quite tiring, but huge fun. I can't claim any credit for the organisation, so I congratulate those who can on a very well organised event. This is something where we can go to a bit of trouble, as pilgrims, and make a real witness to the faith. More photos. Stop press: Fr Julian Large Cong Orat has been elected as Provost, succeeding Fr Ignatius Harrison Cong Orat. Fr Harrison has been Provost for as long as I can remember, so this is of more than passing interest. Fr Large has always been a great supporter of the Traditional Mass, and I wish him well for this important role. Fr George Bowen Cong Orat has been elected Vice Provost. Yesterday, continuing my training for Chartres, I walked from Woodstock to Witney, and most of the way back. One of the nice things about using footpaths is that they connect the ancient villages in the same way they have been connected for centuries, indeed for well over a millenium I should imagine, in most cases. They often go right past ancient churches, which of course are good landmarks. I always have a look inside, if it is unlocked. Yesterday I was rewarded with two magnificent late-Medieval Dooms, in St Mary's, North Leigh, and St James the Great, South Leigh. The Roods these churches would have had were smashed up at the Reformation, and the wall paintings were painted over, but they were uncovered in the 19th Century in these cases and remain splendid testaments to Catholic theology and devotion. They sit above where the Rood would have been; it is important to remember that the suffering love of Our Lord on the Cross, where he paid the price of our redemption, would have been the companion to these depictions of the resurection and judgement of the good and the bad. 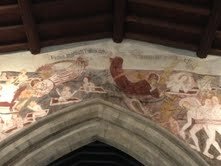 St James has another wonderful picture on the south wall, near the door, of St Michael weighing a soul. The soul sits in pan of the scales, while devils are trying to pull the other pan down. They will be using the poor fellow's sins to weigh it down, but Our Lady stands by the soul, and seems to be dropping rosary beads into his side of the scales, and indeed it is going down in his favour. What a wonderfully graphic lesson for the worshiper. I can usually find something to complain about when looking at the little booklets on the history of the churches. Apart from failing to mention the small matter of the Protestant Revolt (oops!) which is more or less invariable, the good people who wrote the St James the Great one couldn't quite bring themselves to inform readers that 'St Clement of Rome' was actually, er, Pope. This is hardly irrelevant, since it explains the triple tiara he is wearing. It is interesting that the people of this tiny Cotswold village had a devotion to the fourth pope, who is mentioned in the Roman Canon. 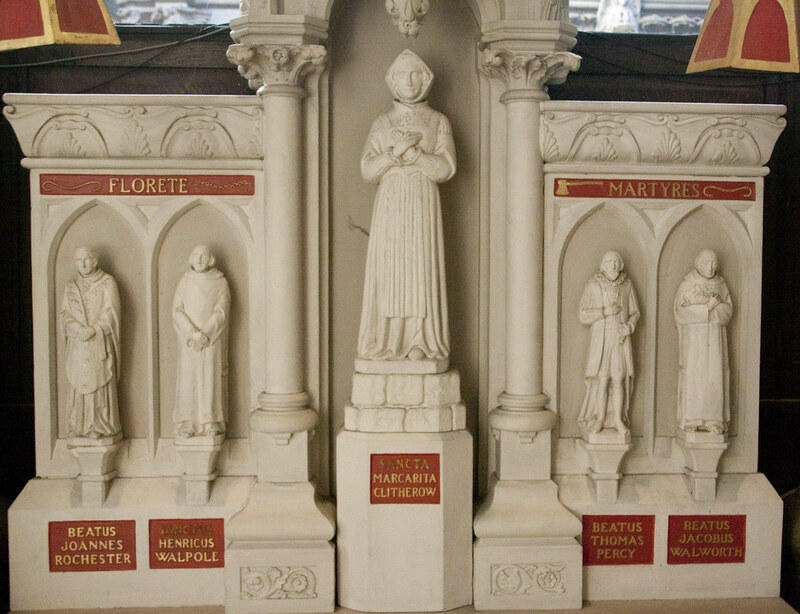 The paintings were uncovered in late 19th Century by a vicar, Gerard Moultrie, whose interest in things Catholic is also evidenced by the fact that it was he who translated one of the most moving English hymns, 'Let all mortal flesh keep silence', which is from the Liturgy of St James. The ones at St Mary's were uncovered in 1864 by the architect G.E. Street, who was working on the church. We owe a lot to these men, who have preserved these striking things from our Catholic past. What the Anglican church-goers have made of them for last century and more I cannot imagine. 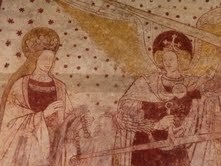 St Mary's also has a very impressive Medieval tomb, showing Sir William and Lady Elizabeth Wilcote. 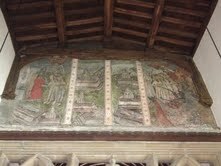 Like the paintings, this dates from the 15th Century: a century of great growth and energy in the English Church. Alas, the Requiems they intended for the exquisite Chantry Chapel would have ceased to be said after less than a century. In future perhaps I should take a proper camera with me; I hardly do these great paintings justice. For what they are worth, the full set is here. This is part of the talk Colin Mawby gave at the Gregorian Chant Network weekend course, 9th April this year. 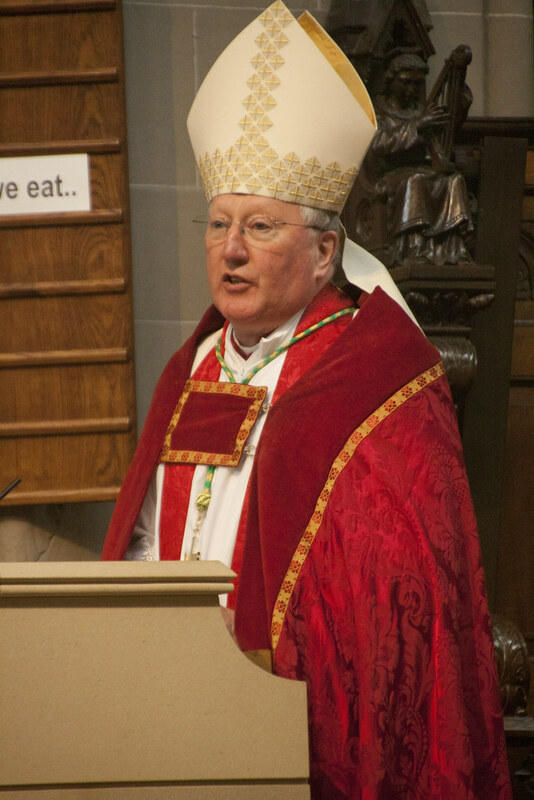 Mr Mawby unhelpfully conflates two different considerations: the responsibility of Bishops' Conferences to regulate the publication of music to be used in the celebration of the Mass and the function of ICEL to maintain the integrity of liturgical texts in English and to administer the copyright of such texts on behalf of the Conferences. It is idealistic to imagine that the complex, lengthy and costly process whereby English translations are made and approved could be funded by individual Conferences when the reality of the situation is that the income from such copyright enables the subsidy of the production of liturgical books in those parts of the world where publication would not otherwise be possible. I'm glad to say I don't have a dog in this fight; the whole thing just seems a bit rum, and I'm very grateful to be using musical materials which are in the public domain. One of the really handy things about the Old Mass is that vast amounts of the text, in Latin and in various translations, on online. Try finding the Latin texts of the propers of the 1970 Missal and you quickly run into a brick wall. Using copyrighted compositions, too, can be a pain, but anyone wanting to use Chant can download several different editions of the chant for the Mass for free, thanks to the Church Music Association of America. The polyphonists of the Schola Abelis have been known to edit their own texts of the music they want directly from the sources. 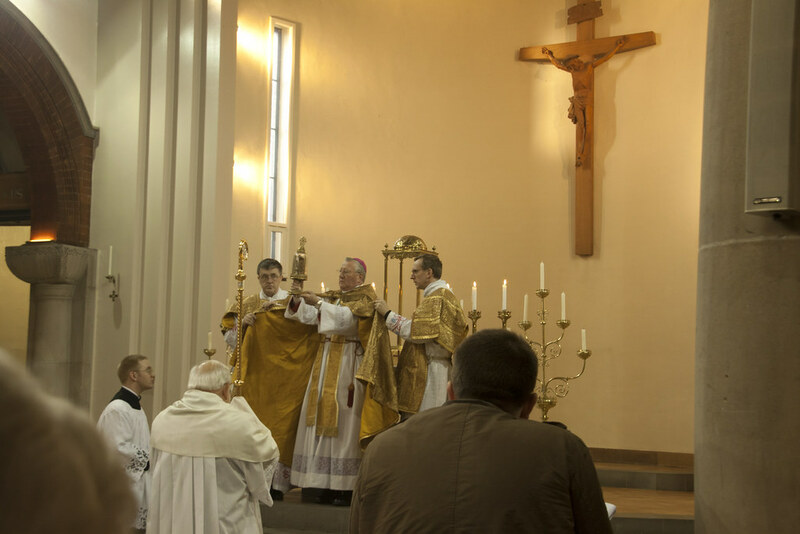 Yesterday was Mothering Sunday; it was also the 3rd Sunday of the month, and so there was a Sung Mass at SS Gregory and Augustine's, where Fr John Saward wore his Rose vestments. 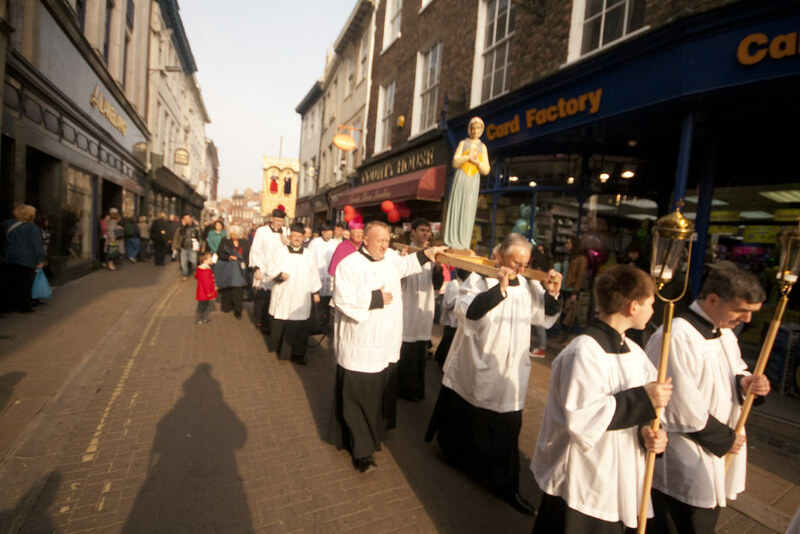 The connection between Laerare Sunday, Rose Vestments, and mothers, is somewhat obscure. Fr John explained in his sermon that the Station Church for the day is Sta Croce in Jerusalem, a church which originated as the palace chapel of the palace belonging to St Helen, mother of the Emperor Constantine and finder of the True Cross. She wished to make this chapel a little piece of Jerusalem in Rome, even digging soil from Mount Calvary into the foundations. When the Pope and people of Rome go to Sta Croce they are, therefore, visiting Jerusalem, symbolically, the original fountain-head of the Church. There are many references to Jerusalem in the propers of the Mass. According to Fr Mark Elvins, in his book 'Catholic Trivia', the connection with mothers is suggested by one of these references, in which St Paul (Galatians) is giving an allegorical interpretation (Biblical critics of a sensitive disposition, look away now) of the story of Isaac and Ishmail, the two sons of Abraham, one by the free wife Sarah, according to God's promise, and one by the slave Hagar. The Christians are the children of the promise, and of the heavenly Jerusalem represented by Sarah. 4:26f But that Jerusalem which is above is free: which is our mother. For it is written: Rejoice, thou barren, that bearest not: break forth and cry thou that travailest not: for many are the children of the desolate, more than of her that hath a husband. Ille autem, quæ sursum est Jerusalem, libera est, quæ est mater nostra. 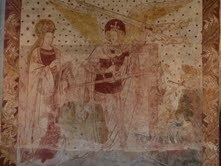 Scriptum est enim: Lætare, sterilis, quæ non paris; erumpe et clama, quæ non parturis: quia multi filii desertæ, magis quam ejus quæ habet virum. Today the Pope can bless a golden rose, and present it to a Catholic monarch, church or shrine; this apparently suggested Rose coloured vestments. It is interesting that this charming custom is carried out in this joyful interlude of Lent, rather than on a more obviously festive occasion. A 14th Century golden rose, right, from the Wikipedia article. This year the parish church of SS Gregory & Augustine, in the Woodstock Road, Oxford, is celebrating its centenary. 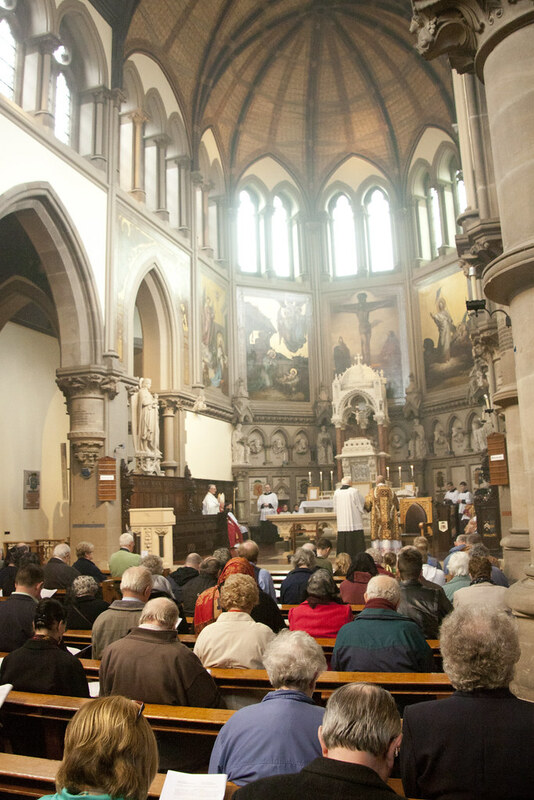 It was founded a few years before the re-establishment of the parochial system (in 1918), as a 'mission church', thanks to the efforts of a convert philanthropist Charles Robertson. It was the first church in Oxford to be looked after by the secular clergy: by the time of its construction, not only were the Jesuits long active, but the Capuchin Fransciscans and the Benedictines had both also arrived. Monday 12th was the Patronal Feast, that is Pope St Gregory the Great, and there was a splendid Solemn Mass in the evening. 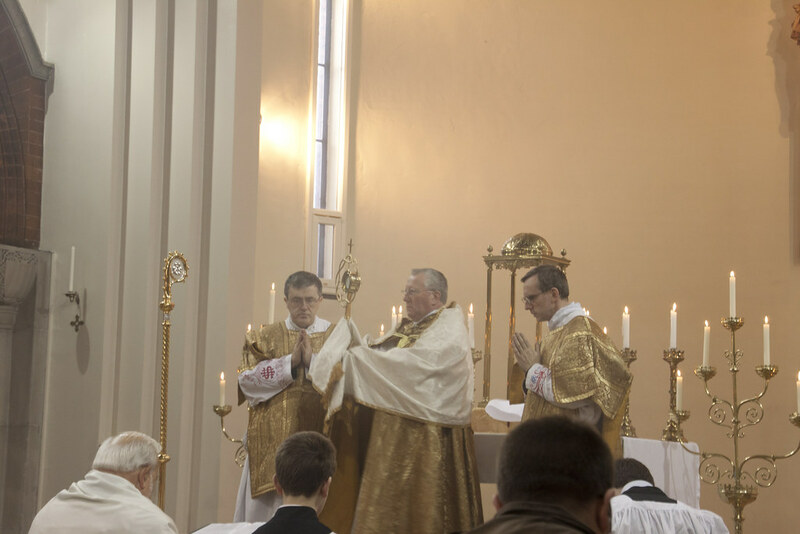 There were more than 100 people in the church, with another 20 in the choir loft: a choir of boys from the Oratory School, who accompanied the Mass. They were reprising their role on the same feast in 1941, and sang the same works as their predecessors had done 71 years ago. 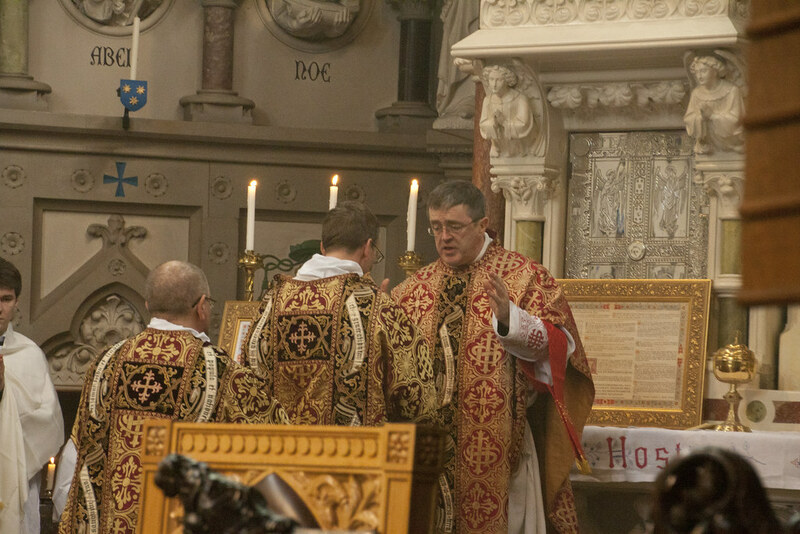 Fr Richar Duffield of the Oxford Oratory preached a very interesting sermon about the founding of the church, which you can read here. "Pursuant to the decision made by Pope Benedict XVI, Bishop Fellay was, in a letter delivered today, informed of the evaluation of his response. The letter states that the position he expressed is not sufficient to overcome the doctrinal problems which lie at the foundation of the rift between the Holy See and the Society of St. Pius X. "At the end of today's meeting, moved by concern to avoid an ecclesial rupture of painful and incalculable consequences, the superior general of the Society of St. Pius X was invited to clarify his position in order to be able to heal the existing rift, as is the desire of Pope Benedict XVI"
See the whole communique on the Vatican Information Service blog. 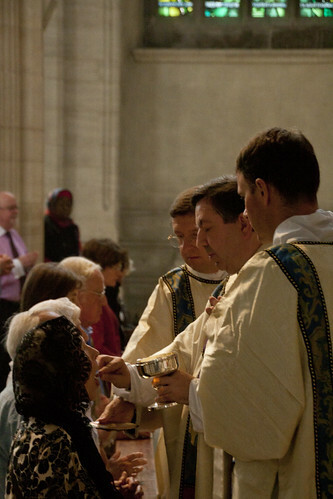 Communion at the LMS Annual Mass in Southwark Cathedral. Suppose a person previously unknown to a priest pops into the sacristy just before Mass starts and announces to the priest: 'By the way, Father, I am in a objective state of mortal sin'. We may imagine this information is conveyed by a statement such as (out of wedlock) 'This is my lover'. 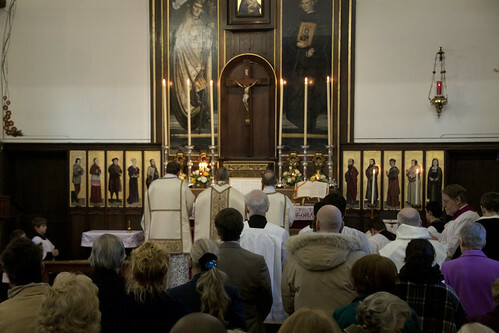 Then, when it is time for Communion, this person is present in the line. Should the priest give the sinner Communion? It is essentially this situation which the canonist Edward Peters deals with in his latest blog post. Never mind any possibility of disputed facts, this is what Peters addresses, as a matter of principle. I appreciate a nice argument, and Peter's post is, in its own way, a thing of beauty. His answer is that there are no grounds for refusing Communion. 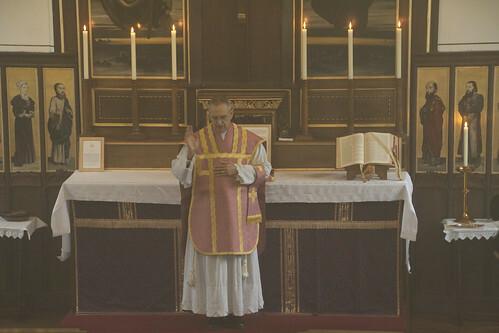 A priest should refuse Communion to a baptised Catholic on one of two grounds: 'notorious' public sin (canon 915), or objective lack of the right dispositions (canon 843). Although the person at issue has made her manner of life known to the priest, it is not clearly 'notorious' (known to the rest of the congregation), nor is it a matter of objective legal status (such as being divorced and remarried). And although she is clearly not properly disposed, her lack of right disposition does not count as objective (it's not what she's actually doing that day in public, it was a private statement to the priest), and subjective lack of disposition is something of which a priest cannot know. Peters is getting a lot of flack for this position, and I should say that he is in general a Good Thing. He constantly reminds his readers of the reality of canon 915, and how it ought to exclude pro-abortion politicians and the like from Communion. He's no liberal. But the above argument seems to me a good example of the legalism into which many conservative Catholics have retreated. Peters has more excuse than most, because he is a canon lawyer, but it is a more widespread phenomenon. Because liberal dissidents are constantly getting away with defying Church law, Church law seems a good stick to beat them with, but the danger is that the law can be made into a fetish. We had this over the liceity of the 1962 Missal: for years we were told that 'most canonists' held the view that it had been abrogated. Well, it seems 'most canonists' were wrong, and now the Holy Father has said so. But for the period from 1969 to 2007 trads who made the argument that the 1962 books were still part of the Church's legitimate and current liturgical tradition were branded by conservatives as antinomians. The fact is that common sense does have a part to play in the interpretation of law, in the Natural Law tradition, of which the Church's law is firmly a part. Natural justice, the good of souls, tradition, and moral and theological principles are in no way irrelevant to what is objectively and legally the right thing to do. I don't say Peters denies this. But in seeking a solution by the minute examination of the canons, and the words of their interpreters, as we would expect a canonist to do, he has come up with an answer which defies reason. I am not a canonist, and I am willing to bow to the judgement of the Church on this, but let me just summarise what seems a bit barmy about Peters' conclusions. 1. Notoriety. Peters says the priest doesn't have sufficient grounds for assuming notoriety. But here is a woman who makes a point of telling him that she is in an immoral relationship. It is highly likely that (a) she is referring to co-habitation, which is a public matter, (b) her situation is known to a proportion of the congregation, who in this case are friends and relations of her late mother, and (c) she is telling everyone she meets who doesn't know about it, just as she is telling the priest. She is clearly 'out and proud', and wants people to know. By all means let us err on the side of caution when barring notorious sinners from Communion, but Peters' understanding of 'notoriety' seems to use the letter of the law (or of the tradition of its interpretation) to defeat its spirit. The law is to protect against public scandal, and it is public scandal which this lady wishes to cause by announcing her sinful way of life and then presenting herself for Communion. 2. Disposition. 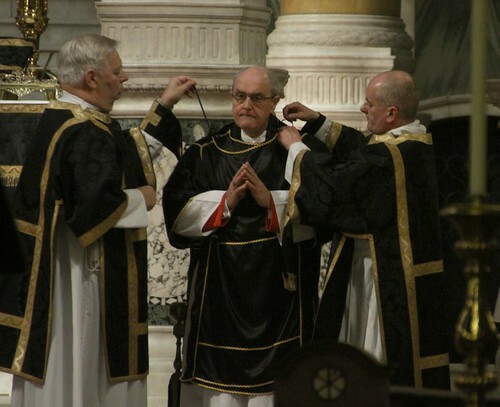 Priests can only bar people from Communion on the basis of what they, the priests, know - obviously - so the tradition of interpretation (Peters tells us) distinguishes between objective factors, knowable to the priest, and subjective ones, which are unknowable. Objective factors are understood by canonists as public ones, such as being evidently drunk. Subjective factors are the individual's state of sin or grace, which is in principle known only to God. But here we have the individual making known to the priest not only her sinful life but her being unrepentant, as far as it is possible to tell, so what is normally on the subjective side of the distinction is objectively verified as much as one could wish. If a priest can refuse Communion to someone he perceives as drunk, or who 'curses the minister', it is simply bizarre to suggest that because a sinful life at home would normally come under the 'subjective' heading it cannot cross the line into the objective category when the person at issue actually tells the priest about it. Again, the letter of (the interpretation of) the law appears to be defeating its spirit. The purpose of the law is to prevent sacrilegious Communions where the danger is so evident that there is no question of a Catholic being refused Communion unfairly. And that is exactly what is at issue here. I would add two further points. In the world we live in, in the context of the debate going on about homosexuality and the Church, a priest with any psychological insight is perfectly justified in seeing the announcement of having a 'lover' as a deliberately provocative claim designed to lay a trap at Communion time. The fact that it was made impossible for the priest to continue the conversation any further strengthens this impression. The 'lovers' wished to make sure the priest knew that he was giving Communion to someone committed to an immoral way of life, so either they could show the world that the Church in practice will go along with such a way of life, or they could cry blue murder if the priest refused. Now perhaps I'm assuming too much; I wasn't there. But - and this is the second point - this particular priest was there. He heard the tone of voice, he saw the body language. 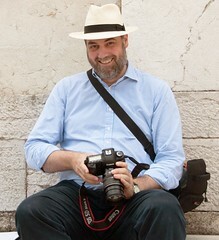 If he's going to be hung out to dry because what was perfectly clear to him doesn't tick certain boxes in the definition of public knowledge or objective bad disposition, then that is not only unjust but it creates a situation in which priests are going to be treated with a hermeneutic of suspicion which is simply unworkable. We have to allow priests, in awkward situations, where there is little time to consider all the tomes in Edward Peters' library, to take a reasonable view of a situation, and we even have to accept that they will make the occasional mistake. Regardless of what the canonists of old might have said, I find it hard to imagine priests getting in trouble for acting in this way in the days, sadly long gone, when there was some sanity applied to the government of the Church. Let us pray for our priests this Lent. And this doesn't even broach the question of whether 'brain death' is a genuine diagnosis of death. Which it isn't because people can recover from 'brain death' and by definition you don't recover from death (except by divine intervention). Life is increasingly imitating Monty Python. 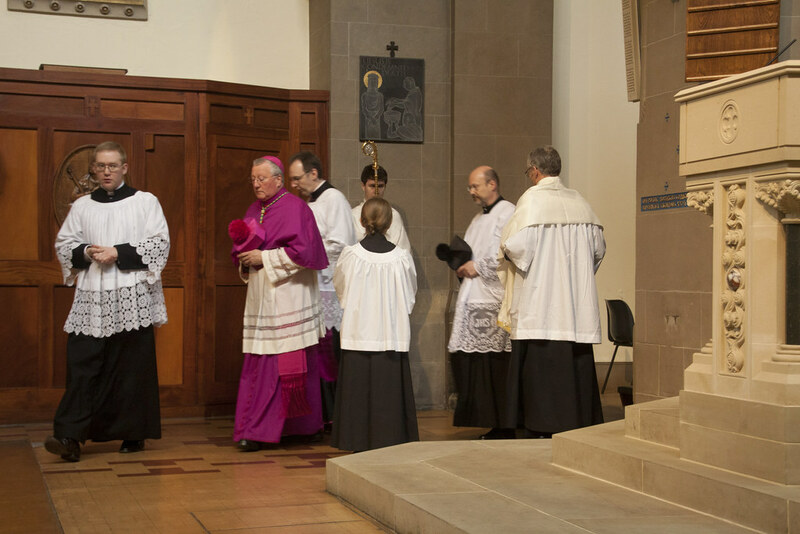 Clergy pilgrimage to Catholic Bavaria 7-11/12 May 2012, led by Fr Armand de Malleray, FSSP. 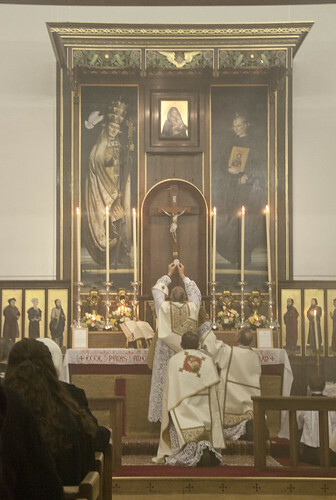 Friday: free time and take off from Memmingen at 3.10pm – OR stay on and attend Diaconal Ordinations at FSSP Motherhouse next door on Saturday morning by Bishop Castet of Luçon (French Vendée), with take off at 3.10pm after ceremony and landing in London at 3pm (or any airport of your choice). Also planned: next door is the International Seminary of St Peter and motherhouse of the Priestly Fraternity of St Peter. Joseph Cardinal Ratzinger visited there on Easter 1990 and offered Easter Mass in the usus antiquior. A visit of the seminary and meal(s) with community can be planned for us. Possibility of attending some of the community Masses and Divine Office. 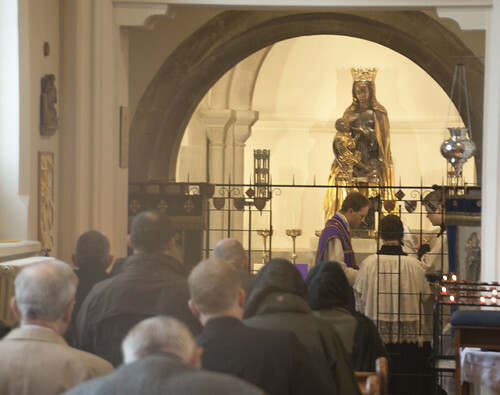 Although a pilgrimage, it will not be penitential but surely Marian, especially in Bavaria in the month of May, when the immaculate Queen of the country – Maria Patrona Bavariae – is honoured in a particular way. Accommodation: We will be staying at the Marian shrine of Wigratzbad, in the comfortable Pilgrims’ Hostel with the option of single rooms with ensuite bathroom. Estimated cost: £400 (all inclusive for 5 days in single room). Cheaper if 4 days and no ensuite bathroom. For convenience, each priest will book his own flight. 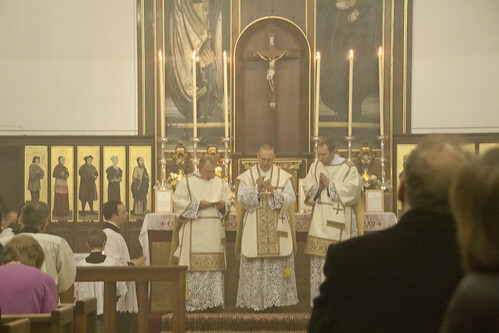 Booking: We only ask you to send us a £30 cheque as deposit made payable to FSSP ENGLAND. Please specify your name, contact details and whether you wish a single or shared room, with or without ensuite bathroom. 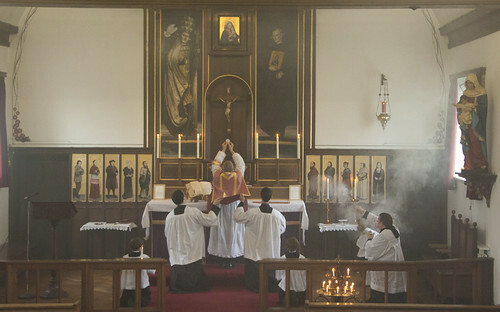 Liturgy: Priests are obviously free to offer daily Mass using the Missal of their choice. Please contact Fr de Malleray if you have any questions: malleray@fssp.org. I've published the second Position Paper: go over to Rorate Caeli to see it! 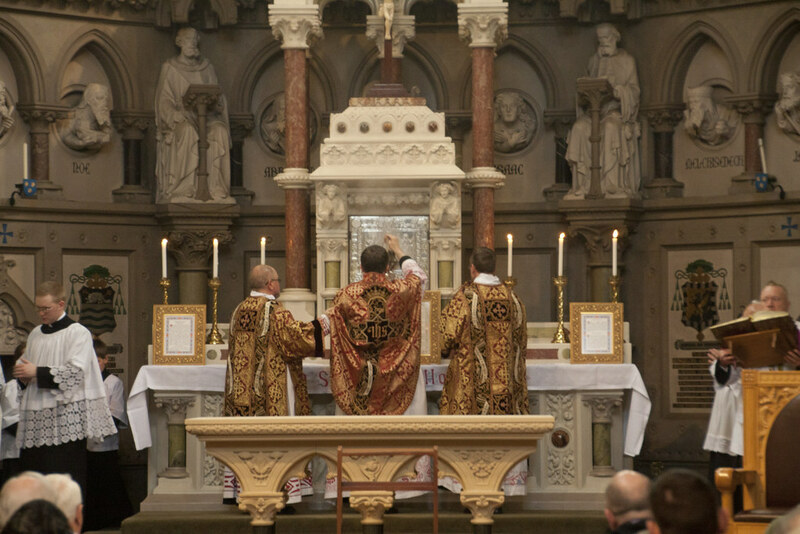 It addresses the objection to the TLM that it makes it harder to participate in the Mass, what with it all being in Latin, or silent, with the priest having his 'back to the people' and so on. The argument of the paper is that, in fact, these and similar things makes it easier to participate, because they communicate the necessary sense of awe. They contribute to the 'sacrality' praised by the Holy Father as a feature of the tradition. 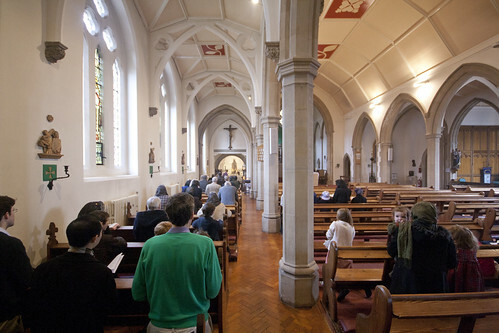 It took place last Saturday and was very well attended; I counted 55 people, which meant we were spilling out of the side aisle which looks into the shrine chapel. 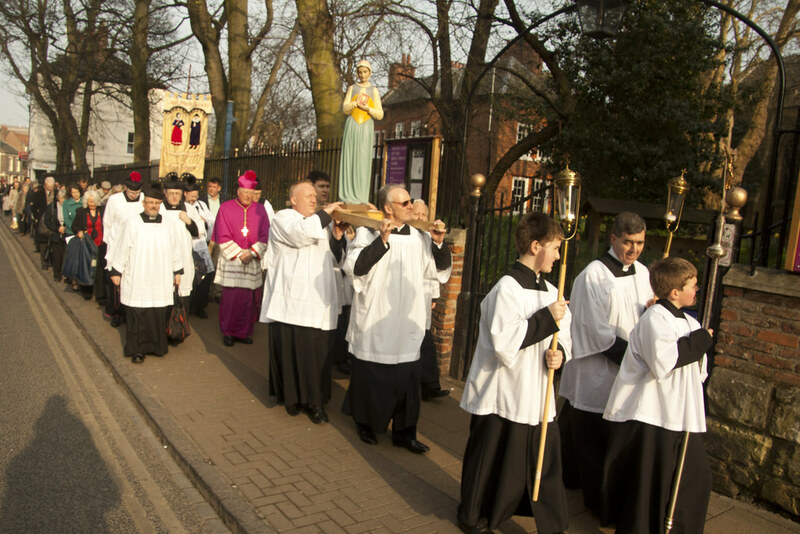 It is a wonderful shrine - the Archdioces of Birmingham's Marian Shrine - and it was a great occasion. 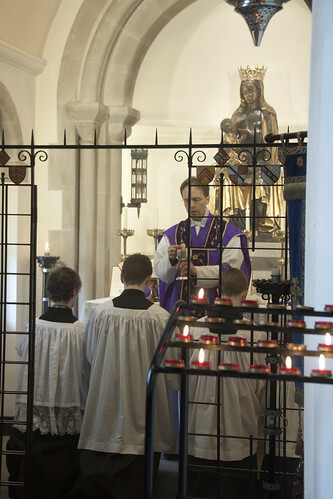 Fr Armand de Malleray sang Mass for us, and the Schola Abelis accompanied it. 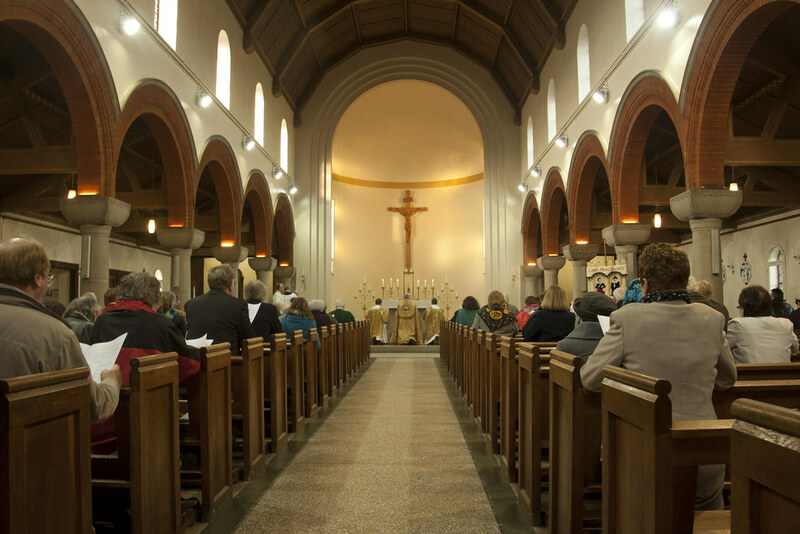 Thank you Fr Giles Goward and the parish of Our Lady and St Anne, Caversham, for welcoming pilgrims like us to this inspiring piece of our Catholic heritage! 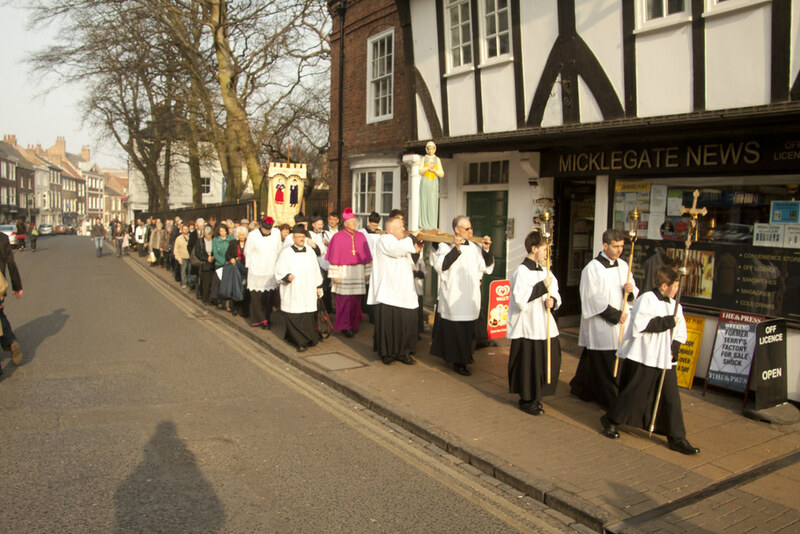 I've posted more about the shrine in my report on last year's pilgrimage, here.